A long, long time ago, some people asked me to make a video tutorial about how to make Custom Catalog Thumbnails as that was something I didn't explain at the end of my other tutorials. There just suddenly was one in Studio or in the game. Now some time later, we also have the ability to make Custom Catalog Thumbnail Overlays. What these things do is placing one text and/or image to all recolors available for one object in just 3 mouse clicks. As not everyone knows why you should add a custom catalog thumbnail or catalog thumbnail overlay to your mods, I made a video tutorial about it. First of all I will explain the difference between the two, followed by how to make them in Photoshop to end with how to add them to your mod in The Sims 4 Studio. If you got any questions about it, please ask them here in this topic or in the comment section on Youtube. I got a lot more tutorials on my youtube channel and there're going to be many more. So if you don't want to miss them, please subscribe! 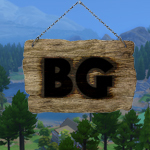 If you want to have an overview of all The Sims 4 Tutorials I made on my Youtube Channel, please take a look at my BakieGaming Video Index here on the Forum. In there, you will find links to all tutorials here on the forum and links to all tutorials that are only available on YouTube.